Felicity is both a ceramicist and writer. She has contributed regular articles about antiques and ceramics to ‘Ireland Homes’, ‘Interior and living’ magazine and ‘Ceramics Ireland’. She ran a local auction for over 20 years together with her husband Robin. 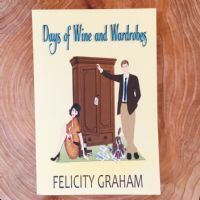 ‘Days of Wine and Wardrobes’ is a sideways and totally fictional tale based on her experiences from that time and is her first novel.